In Chabon’s first nonfiction venture, he offers a collection of personal and critical essays, some of which are destined to become seminal pieces on the nature of “genre vs. literary” fiction, on the (as the reader below mentions) “genre-fication” of books in mainstream bookstores, and even on the origins of fan fictions and metafiction (Chabon credits the Sherlock Holmes books, with their narratives wrapped inside narratives, as having popularized metafiction). The critical essays, in other words, seem bound for a long life of citations and anthologizing. The personal essays, those that discuss how Chabon developed ideas for “Yiddish Policemen’s Union” and “Amazing Adventures,” are interesting, also, but a bit less rewarding. They all seem to compose the final act of this collection, and so Chabon has already made his strongest arguments. When he begins delivering a personal essay about his love for golems (an essay that originated as a lecture, and that blurs the line between fiction and nonfiction), we already sense each point before he makes it. Though the essays could stand on their own, they become repetitive once collected. That said, though, “Maps and Legends” is a book that needed to be published. 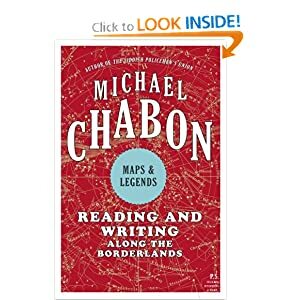 Chabon is giving voice to a lot of the genre-literary ideas that many in our generation have long discussed in private, and he is essentially staking his career on his opinions. Very brave book, very well-written, as always.